I had to marinate on that one for a bit, but once it clicked, it completely made sense. When I worry, I imagine all the things that could go wrong in a situation and how I will gain control of it to reduce the chance of something else getting screwed up. But when I worship, I dig down deep and let go of the worry and attempt imagine everything God is capable of and how He will take my seemingly impossible situation and turn it into something good. I let go of control and imagine all the incredible things God can do that I definitely can’t, no matter how much control of the situation I have (which, as it turns out, is zero, zilch, nada, none). We must stop checking the “fearcast” and start checking the “faithcast.” Fear tells me there is a 99% chance of the worst case scenario coming true. Faith tells me there’s a 1 billion percent chance of God coming through. We can expect to see the goodness of the Lord! He has been too good for us to stay anxious! August went by quickly, as the summer months tend to do! Pour yourself some coffee and see what I’ve been up to! God has a funny way of proving me wrong…a lot. The English Academy at our church was something Pastor Victor tasked me with over a year ago. He figured that because I’m from the States, I was a teacher in the past and have serious “get-stuff-done” abilities, that I was just the person to do it. Well, I dragged my feet on this project…a lot. I hated teaching in the States, I knew nothing about teaching English as a Second Language and I had no clue how to begin. On Sunday, August 20th, SIX people from our church in Soyapango were baptized! Hallelujah! And even more exciting, TWO of those people are children at our Development Center and one is our cook at the Center! 🙌🏽 God is moving in great ways in our churches here in El Salvador. If you’ve ever seen me “get my worship on” at Rock City Church, you know that I love my worship time! For me, when I have my arms in the air and my life completely surrendered to God, that’s when He plants dreams in my heart and calls my spirit to Him. This past Saturday, the youth (and young at heart!) of our church got together for a night of worship and thanksgiving. And we weren’t alone! Our churches in Soyapango and La Libertad joined us! It literally brought tears to my eyes to be singing alongside Salvadorans and people from the US. I sang in English and Spanish. God hears us all and He understands every language. Wow. Vladimir, my lifegroup leader, shared a message about being thankful in every situation – happiness, stress, success, stress, gains, losses – we must remember to thank God for all of it! …not a building! This Sunday, Iglesia Gran Comisión San Salvador will move from our current building to an auditorium in the Sheraton President Hotel! The rent at our current location was raised to a point we could no longer afford, so after months of praying and searching, our pastors found our new home for the next year! We had our last service at the old space last weekend, and it was truly bittersweet. I am sad to say goodbye to the only place I have ever known as church in this country, but I am so excited to see what God does in the new place! Recently, our local church hosted a 2-week seminar on spiritual gifts. I had taken one of these tests years ago, but so much has happened in my life in the past 3 years that I thought I should probably try again. I was tied with two gifts – teaching and faith. Well, teaching totally makes sense. But faith?? I usually feel like Peter walking on water – 2 steps on the water and 1 step drowning. My faith is super strong when I can see what God’s doing and understand His plan! But the other 99.99% of the time, my faith wavers because I have absolutely zero clue how He’s going to take care this situation or restore that relationship, and it’s hard to have faith in what I can’t see and don’t understand. But I’ve come to learn that just because you have a spiritual gift, doesn’t mean you’ve mastered it yet. I liken it to someone with a natural gift for piano. Sure, she can sit down, read the music and plunk out a pretty good tune on the first try, but if she doesn’t practice day after day, month after month, her gift will go to waste. So it is with my gift of faith. I can sit down, read the Bible and spout off a pretty good prayer, but if my faith is not tested, it will never become the gift God planted in my spirit. I never really thought about that – when we close our eyes for the last time, it is our last test of faith that we will awake in the glorious presence of Jesus Christ. Now, THAT kind of faith I have! My faith is weak in areas where I have to trust that God has already resolved every troublesome situation in my life. My job, friends, marriage, family…God has it all figured out! He could tell me how it all turns out if He wanted to, but that’s the thing – God wants to see if I trust Him enough, if I love Him enough, if I have faith enough to hand over all those situations and the million possible outcomes to Him. “Faith is absolute trust in God— trust that could never imagine that He would forsake us.” I have faith that God is with me through every trial, every joy, every moment of every day. Even when I cannot feel Him, He is there. Will His plan always be my plan? Absolutely not. Will that hurt? Probably. But is His hand always on my hand? Absolutely yes. Hola? Aloha? Χαίρετε? It has been awhile since I’ve gotten any mail! Stay in touch! I would also love to videochat with you! Send me a message and let’s plan something! For our English Academy! We are three weeks in and it’s going so well! We have about 15 students, TEN of which are new to our church! This weekend we will be sharing the Gospel with them! Please pray that God’s words fall upon open hearts and that some soul-changing happens! That the last approx. $2,500 would come soon for the Dental Clinic equipment. For this weekend’s church service! It will be our first service at the Hotel Sheraton! There are many perks to this location (free coffee! 😻☕️), but also many quirks we will have to work out! For the health and safety of all our children at our Development Centers in Soyapango and on the Volcano. That my time back home (I’ll be in Ohio Sept. 27 – Dec. 8!) is rejuvenating and spirit filling! 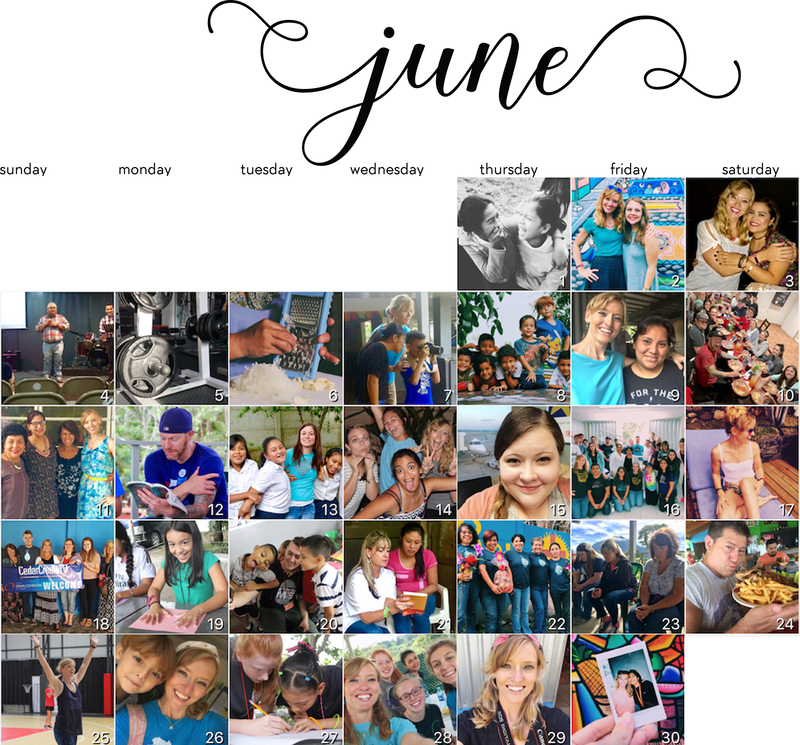 July was a wild ride here in San Salvador! We hosted three mission teams and finalized plans for our English Academy! Another great part about mission teams is how they support our projects. We are currently raising funds to equip our brand new Dental Clinic at our Children’s Development Center on the Volcano. Building the Clinic itself cost $40k and equipping it will cost $18k. It is because of supporters all over the world and especially mission teams, that we were able to build the clinic and are now just about $2,500 short from being fully funded for the equipment! When people come on mission teams, they are able to see the need firsthand and have a better understanding of the visions God has given Pastor Victor for His people here. If you are interested in learning more about our Dental Clinic and how you can help, click here! Over a year ago, God gave Pastor Victor a desire to create an English Academy through our local church. After months of planning, Academia Gran Comisión is finally a reality! For the people of El Salvador, speaking English isn’t a privilege – it’s a necessity. Being able to speak English can drastically improve a person’s income from an average of about $400/month to as much as $1000/month. Not only are we hoping to improve people’s socioeconomic status, but we are hoping to permanently improve their eternal status! We will be using this Academy to share the Gospel of Jesus and invite people to church! Each student will be paired with a conversation partner – someone who speaks both Spanish and English fluently to practice with over a meal or coffee once a week. Our hope and expectation is that these partnerships will naturally evolve into discipleship relationships! My involvement with the English Academy is as a curriculum writer and teacher (my fellow missionaries Ali and Moriah will also be teaching)! Yes, I taught high school English in Ohio for five years, but this is TOTALLY different and TOTALLY out of my comfort zone! This first “semester” (16 weeks) of classes will be a pilot/test class, and next year we are hoping to be able to purchase an actual English as a Second Language curriculum. Click here to see a fun little video we made to advertise our open house for the English Academy! Basically, Vladi keeps telling me to change my language and finally gives up and takes over! …PLANNING MY FIRST TRIP HOME! I will be arriving in Columbus in the evening of Wednesday, September 27th and returning back to San Salvador Friday, December 8th. But most of all, YOU! Friends, there have been babies born, weddings, graduations, birthdays…the things I miss about home most aren’t actually things, but PEOPLE. These nine weeks home will be spent connecting with friends and supporters and spending time rejuvenating my spirit with you! Have you ever prayed super hard for something? I’m talking like every morning, every night, in the shower, in the car, every chance you have, you’re praying to God for something? I feel that I am in a season of unceasing prayer right now. There is something in my life that I need God to come through on. I have genuinely prayed. I have enlisted my prayer warriors. I have turned to the Word of God for wisdom. But at the end of the day, all I can do is leave the situation in God’s hands and trust that He will come through in His way and in His timing. I recently stumbled upon a message from Steven Furtick, lead pastor of Elevation Church in North Carolina. In his message, Coming Out of the Drought, he talks about the prophet Elijah in 1 Kings 18. The Israelites were in the midst of a drought, but Elijah was trusting God to make it rain. He believed God for something, but every time his servant went back up the mountain to look for rain…nothing. What he was seeing (nothing) directly contradicted what he sensed (rain). So I stand here praying, singing and praising the One who I trust will make it rain and bring resolution. How can I come alongside you while you wait for your rain? How can I be your prayer warrior? For our English Academy! Our first class is this Saturday, August 12th! I ask for prayer for our planning/teaching committee and that God would bring us students with open hearts for His word. For our local church, Iglesia Gran Comisión – Due to a drastically raised rent, we are moving from our current location into a local hotel for the next year. We are currently looking for an office space we can rent to use for storage and as a classroom for the English Academy. Please pray that the move goes smoothly and that God would provide us a location for the Academy. For plans for my time back home. There are a few logistics that still need ironed out, but the big ones have already been taken care of, Praise God! Our lifegroup ladies have started having regular Girls’ Nights! 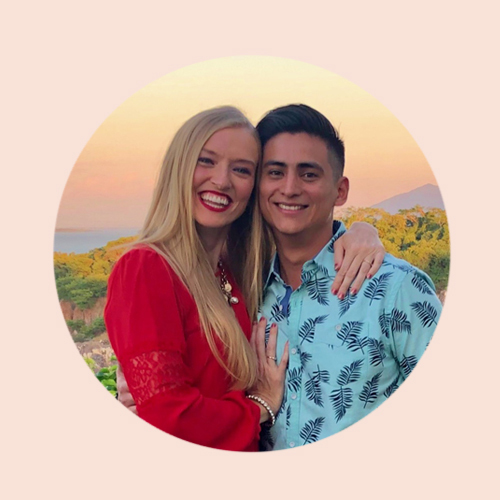 Hilary recently joined our church after moving here from DC to work with a nonprofit organization here in San Salvador! She has graciously opened her apartment to us for our girls’ nights! Another month has just FLOWN by us! 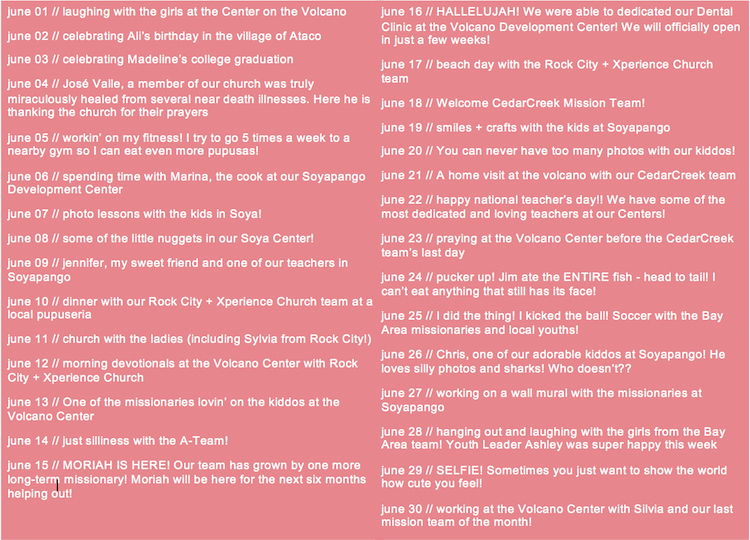 March was filled with Mission Teams and fun with friends! To change things up a bit this month, I am giving you MY FRIDAY FAVORITES! My visit from Becke – She is a sweet friend from home who came for a weeklong visit! We enjoyed (SO MUCH) coffee, movies in bed, (SO MUCH) girl talk, and a sweet time of prayer before she left. I have been more homesick than usual recently and Becke was a breath of fresh (Columbus!) air! Beach day with the Rock City Teams – That’s right – I said, TEAMS! Plural! We had a team from Rock City (my home church) here a few weeks ago, and at the same time, there was a Rock City team in La Libertad, the beachside city to the south. We got to put both teams together and enjoy a day at the beach on their last day! It was so much fun to see friends from home. It was truly rejuvenating. Outings with our youth groups – Last Saturday night, our lifegroup got together for a night of basketball! Needless so say, none of us are very good, but it was great fun being silly with my friends! The next day, Sunday, the Soyapango youth group got together and spent the afternoon at a local park playing soccer, basketball, eating junk food from the local vendors and just laughing together! Their leader, Dani, shared about unity and how God created us to live and work together with our different talents and abilities. We finished out the day with a pupusa dinner! OF COURSE! Bay Area Team – Oh my goodness! This was a HARDWORKING team! They spent 3 days at the Volcano Development Center helping with the beginning steps of creating a soccer field! Basically, it required A LOT of digging in the dirt making trenches. I’ve never seen a team so dirty! Birthday Dinner with Adri – Adri celebrated her 24th birthday on March 16th! She got to celebrate her day with the Rock City and Bay Area teams and the following week she and I went to dinner to continue the festivities! I am continuously grateful for our friendship and am learning from her as a professional in ministry and as a woman of God. Popsicle Flavor: Nutella + Banana. We now have a tradition with mission teams of going to this delicious popsicle place after our pupusa dinner! They have all kinds of amazing flavors! Pupuseria: The 3 pupusas for $1 place! Now that I can afford! They’re delicious AND the owners gave me a mug for Christmas for being a regular customer! Salvadoran Dessert: Semita Alta made by Pastor Victor’s family in La Libertad! It’s a pastry filled with different flavored jam and the Alta means it’s THICK! And when it’s fresh from the oven?! Que rico! Nail Salon: Salon Ramirez, jaja! A friend from church and her daughter often offer to paint my nails! Hey, even a missionary wants to have nice cuticles! Worship Song: Cuan Grande Es Dios. It’s the first song I learned (and understood) in Spanish! Movie Theater: Multiplaza – they have a candy gummies section AND caramel popcorn! Place to Work on the Computer: The Coffee Cup at La Skina shopping center. I can walk there and they know my order! I’m a regular! Coffee Shop: Ben’s Coffee on the Volcano! They can make all kinds of designs in your coffee and there’s a gorgeous view of the city. Drink at Ben’s Coffee: I know I’m in the land of AMAZING coffee, but I will always be a chai tea girl! Beach Resort: This simple little place close to the Atami beach resorts. Some friends and I went there for the Christmas morning sunrise and it was beautiful! Salvadoran Dog: CACHUN! He’s a Boston Terrier that belongs to my friend Lelys! She lets me pretend he’s mine. Salvadoran Slang Word: Puchica! It basically means DANGIT! Place: Anywhere on the beach. The beach will forever be where I feel most connected to God and most at peace with His presence. Walking along the beach, you may find treasured sea glass. Some pieces are big, some small, and each is a different shape, size, and color…Each piece has one thing in common: they are all broken. Tossed in the ocean, they have experienced rough waters, storms, and rough sand. All of which has smoothed and re-shaped the piece of glass into a treasured item…We are also like the treasured piece of sea glass. Broken, we have experienced storms, rough waters, and heartbreak. We are also treasured in God’s hands…Our stories can also be used to point others to God’s healing grace. Our scars and storms are a part of our story, an intricate piece that brings us to where we are today. They reflect the love, redemption, and healing power of our Lord, Jesus Christ. Friends, who can we share our brokenness with today? Who can we encourage? Who can we assure that they are not alone? As always, thank you for your continued prayers and support! And an extra HUUUUGE thank you to those of you that sent care packages with the Rock City team! Your letters and cards and gifts have spoken such love to me! My heart smiled as I opened each package! My heart is filled with jewelry, beef jerky, lemon Oreos, and SO MUCH peanut butter (that’s an odd food combination! ha!)! For our mission team coming from New Life Church in Michigan tomorrow. They will only be with us for two days before heading to La Libertad for the rest of the week. This is much shorter than normal! Please pray that in those two days, God would speak to them and they would hear His voice! For our church family as we drive to San Pedro Sula, Honduras on April 12th for the annual Great Commission Latin America Conference! Please pray for safe travels, lots of learning, and quality connections! For my relationships here – that they would continue to grow and always be God-honoring. This is an Empiñada! It’s basically just sugar and starch that’s been rolled suuuuuuper thin. It reminded me of a giant communion wafer, but tastier!